I am indeed very happy to be present amidst you this morning. This is for the second time that I have come to this National Social Science Congress. 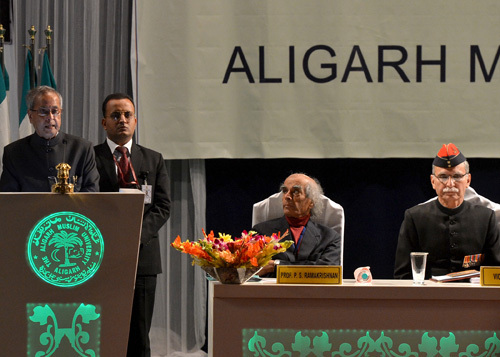 I delivered the valedictory address at the XIX Indian Social Science Congress in 1996 at Allahabad University. My learned friend, Prof. (Late) Basanta Sarkar, was the President of the Indian Academy of Social Sciences. I am familiar with the Indian Academy of Social Sciences and its Indian Social Science Congress since then and value its contributions to the nation. I am happy to know that ‘Building An Ecologically Sustainable Society’ is the focal theme of this session. It is important that our country grows in harmony with Nature. Our relations with Nature should be guided by the principles of reciprocity, limitation, cooperation and sustainability. By ‘reciprocity’ I mean what we take from Nature, we must return in same proportion to it. By limitation, I mean Planet Earth has very limited life supporting resources or attributes. The father of our nation, Mahatma Gandhi often used to say ‘Mother Earth has enough for our needs but not for our greed’. He called for creation of a Hind Swaraj rooted in the principle of ‘From Greed to Need’. Human beings are products of evolutionary and historical processes. So far, the desire to be master of Nature has guided human activities to a considerable extant. This desire needs to be now replaced by the philosophy not of conquest of nature but of cooperation with Nature. We need to evolve new paradigms of ecologically sustainable development. Despite having water on ¾ of its surface, Earth has only 1% drinking water, large quantity of which is already polluted. On top of it, rivers are drying and there is over exploitation of ground water. Where there is water there is life and where there is no water there is no life. So, we need to conserve as well as replenish our water resources. The fertility of our soil needs to be restored without further delay. We need to change agricultural and industrial practices in order to reduce the toxicity in food, water and environment. Conservation of bio-diversity and natural resources merits a serious consideration. Food and energy security and sustainable use of scarce natural resources will constitute important constituents of our strategy for sustainable development. We have recently established a National Green Tribunal under the National Green Tribunal Act, 2010. The Tribunal provides for the effective and expeditious disposal of cases relating to environmental protection and conservation of forests and other natural resources. This includes the enforcement of any legal right relating to environment, including providing relief and compensation for damages. The National Ganga River Basin Authority is yet another example where we are trying institutional innovation to protect the sacred River. The objective of the Authority is to ensure conservation of the river Ganga and to maintain environmental flows by adopting a comprehensive river basin approach. We hope that the engagement of all stakeholders and this new approach will yield positive results. Climate change is a threat but also a unique opportunity to work together. As a developing country on the frontlines of climate vulnerability, India has a vital stake in the evolution of a successful, rule-based, equitable and multilateral response to climate change. A promising start has been made at the domestic level with the launch of the ‘National Action Plan on Climate Change’ (NAPCC). The Action Plan sets out a comprehensive response to climate change in the overall context of development, identifying measures that promote our development objectives while also yielding co-benefits for addressing climate change effectively. The eight missions under the Action Plan cover both adaptation and mitigation, in addition to scientific research. India intends to reduce the emissions intensity of our GDP by 20-25 percent by the year 2020 taking 2005 as the reference level. It is worthwhile to note that policies to promote energy efficiency, and structural changes in the Indian economy have resulted in a sharp and declining energy intensity of the Indian economy. I am happy to inaugurate the 37th Indian Social Science Congress on ‘Building an Ecologically Sustainable Society’ and wish you fruitful deliberations. Organisations like yours and your members can play the most vital role in guiding India onto the path of becoming an ecologically sustainable society. I take this opportunity welcoming delegates from aboard. I whish them a comfortable and productive stay during the period of the conference. I also congratulate the AMU for developing a ‘Social Science Cyber Library’. I am glad to inaugurate the same and hope Social Scientists from across the world will benefit from it.